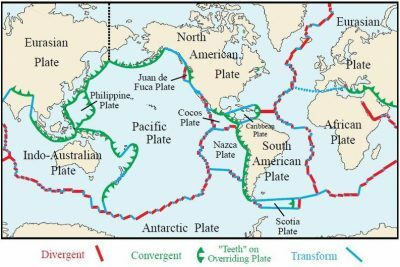 Divergent plate boundaries, also called mid-ocean ridges, oceanic spreading centers or continental rifts, occur where the Earth’s tectonic plates move away from each other. Here, convection in the mantle and asthenosphere, pictured below, brings fresh, hot, basaltic magma toward the surface. As the magma cools, new, rigid lithosphere is created and the plates on get pushed apart to make room for the incoming material. Lithosphere is what the earth’s tectonic plates are made of and consists of the earth’s crust and the uppermost mantle. As shown below, the Earth’s tectonic plates fit together like a puzzle. Because the Earth is not expanding, the pushing apart motion and creation of new lithosphere at divergent plate boundaries forces plates to collide and be destroyed or subducted at convergent plate boundaries. This process, also pictured in the cross-section above, is known as ridge-push slab-pull and is, in a way, a natural recycling system of the Earth’s tectonic plates. 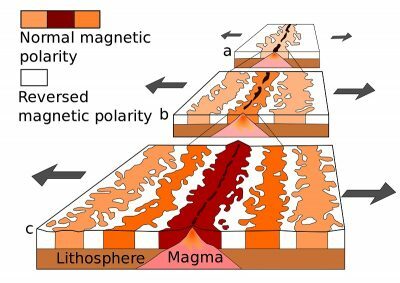 Due to the non-uniform rate of magma being brought toward the surface at divergent boundaries, the plates move apart at different rates. To accommodate this, transform boundaries or strike-slip faults shown above and below, break through the lithosphere allowing pieces of the earth’s lithosphere to slide past each other horizontally at different rates. Divergent plate boundaries are places of lithospheric stretching and thinning, forming low points on the Earth’s surface. This results in many of them existing underwater. 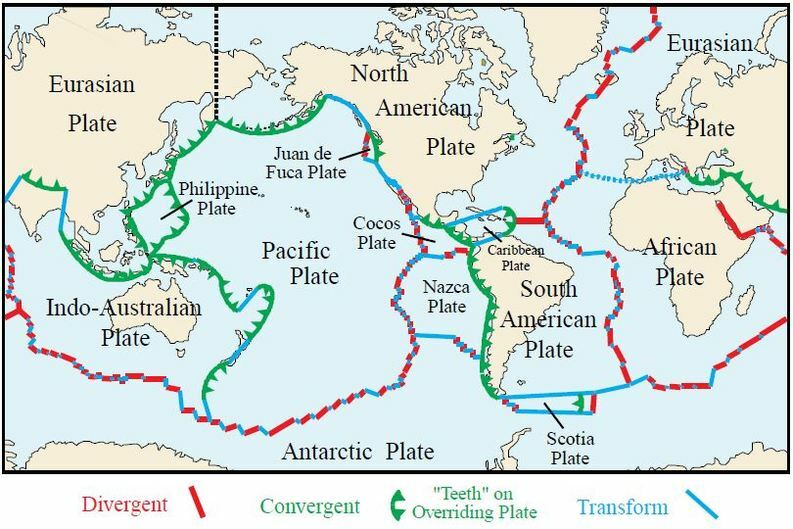 These types of plate boundaries are called oceanic spreading centers or mid-ocean ridges and, thanks to their connection by transform faults, can run for thousands of kilometers along the ocean floor. Divergent plate boundaries that exist on land are typically younger, less common and are called continental rifts. Earthquakes are a common feature associated with divergent plate boundaries and can occur by several processes including: magma making its way through the brittle lithosphere, movement along transform faults, divergence or normal faulting as the plates spread apart and cooling, and contraction of the lithosphere as it moves away from the ridge. Divergent plate boundaries form other unique geological, chemical and biological features described in more detail, below. What do divergent boundaries form? Oceanic spreading centers or mid-ocean ridges produce oceanic crust and a unique type of rock section called ophiolites. 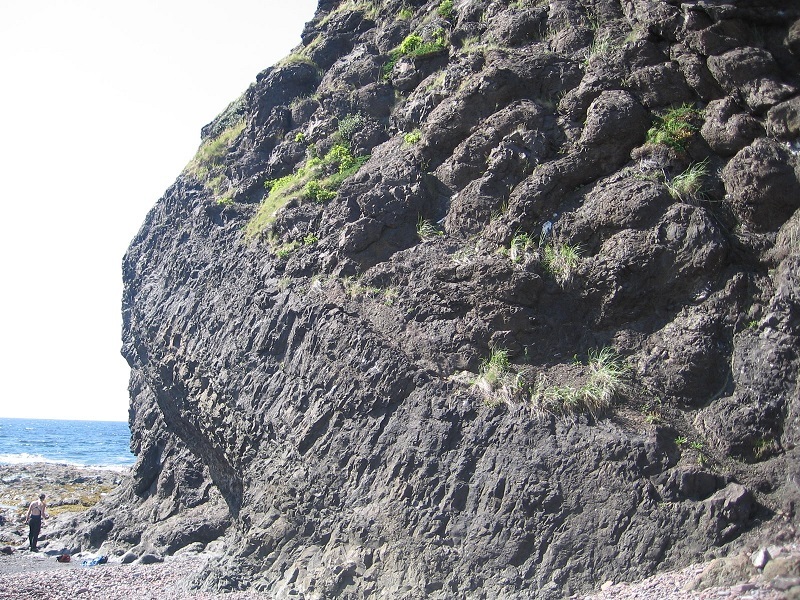 Ophiolites, pictured below, range in thickness from ~5-10 km and consist of distinct geologic layers representing different stages of cooling of the magma chamber. 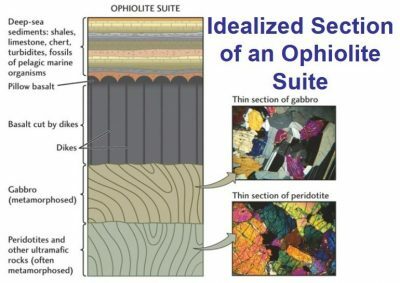 At the base of the ophiolite sequence is a layer of peridotite, which is similar in composition to the Earth’s mantle. 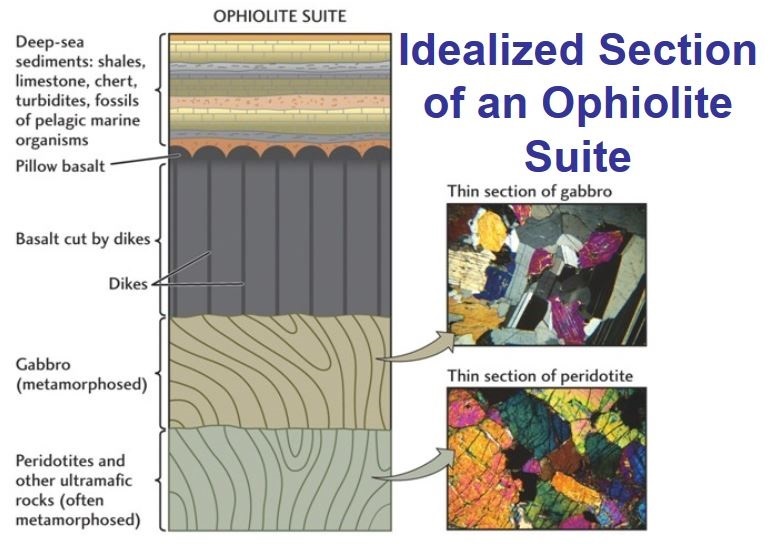 Above the peridotite, fractionation in the magma chamber creates gabbro which feeds sheeted basalt dikes above. As the dikes bring magma toward the surface, pillow lavas forms as the basalt interacts with the seawater. Overtime, as the new section of crust moves away from the ridge, deep marine sediments accumulate on top, covering the pillow lavas like frosting on a cake. Ophiolite outcrops, like the one in Newfoundland, Canada pictured below, have been found all over the world. These outcrops allow scientists to study the structure and composition of oceanic crust, get a better idea of what the Earth’s interior is made of, and better understand the mechanics of plate tectonics. In addition, those found at high elevations, like in the Alps and Himalayas, provide insight into the tectonic history of an area and the immense forces associated with convergent plate boundaries which brought these rocks from the bottom of the ocean to some of the highest points on earth. As magma is brought toward the surface at mid-ocean ridges, hydrothermal vents transport superheated, mineral rich water to the ocean floor. When the hot water interacts with the cold ocean, minerals precipitate out of solution forming black smokers. These chimney-like structures can reach heights of over 60 m and occur at depths of ~2000 m. As black smokers continue to spew out gases and minerals such as iron, carbon dioxide, and hydrogen sulfide, ore deposits can form which have been proposed to be mined for industrial purposes. While most of Earth’s life forms rely on energy from the sun to survive, light cannot penetrate thousands of meters through the ocean. Instead, life at a mid-ocean ridge is sustained by a process called chemosynthesis. Critters use chemosynthesis to convert the inorganic material being precipitated by hydrothermal vents into organic material. Though these inorganic compounds are highly toxic to other lifeforms, extremophiles can use them to survive. Today, scientists speculate whether these extreme biological conditions may have been home to some of the first lifeforms on the planet. The mid-Atlantic ridge lies beneath the Atlantic Ocean and separates the North and South American plates from the European and African plates. 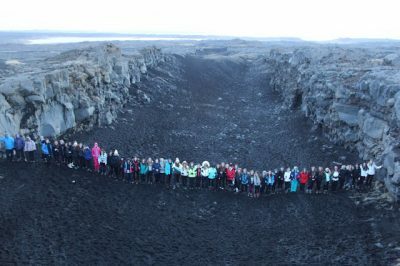 This divergent plate boundary moves apart at a rate of ~2.5 cm per year, relatively slow for a divergent plate boundary, and rises ~2-3 km above the ocean floor. Running over 10,000 miles through the Atlantic Ocean, the mid-Atlantic ridge is the longest mountain range on the planet. This impressive geologic feature makes its sub-aerial debut in Iceland where one can observe active volcanoes, hydrothermal vents and stand between the North American and European plates like the group of students, pictured below. The East African Rift (EAR) is a continental rift valley in Eastern Africa and is a unique type of divergent plate boundary in that it is 1) in its early stages of development and 2) primarily on land. In addition to being home to active volcanoes like Mt. Kilimanjaro, this continental rift zone holds numerous hominin fossils including “Lucy”, the 3.2-million-year-old female Australopithecus skeleton. Lucy’s bones, which make up ~40% of a complete skeleton, were found in the lacustrine deposits of the Hadar formation and changed our understanding of human evolution. Thanks to her excellent preservation in the EAR, Lucy helped scientists discover that our human ancestors began walking prior to developing large brains. This meant that, contrary to common belief, our ability to walk upright may have been a stronger factor in the success and evolution of our species than our intelligence. The East Pacific Rise is located in the eastern Pacific Ocean and separates the Pacific plate from plates as far north as the North American plate all the way south to Antarctica. This divergent plate boundary is known for extremely fast spreading rates reaching up to 15 cm/yr near Easter Island and was where Black Smokers were first discovered. Divergent plate boundaries helped set the stage for the theory of plate tectonics. As early as the 1500’s, scientists and explorers observed that the shape of the North American, South American, European and African continents seemed to fit together like a puzzle. In addition, the occurrence of the same fossils and plants across these continents suggested that they were indeed once connected like that depicted in the 1858 drawing by Antonio Snider below. 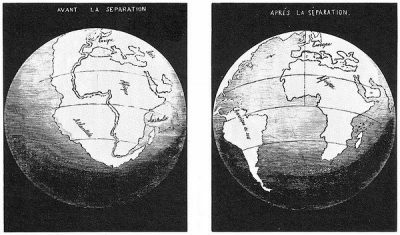 Following these observations, in the early 1900’s, Alfred Wegner proposed his theory of continental drift which stated that the continents moved with respect to one another by drifting across the ocean floor. 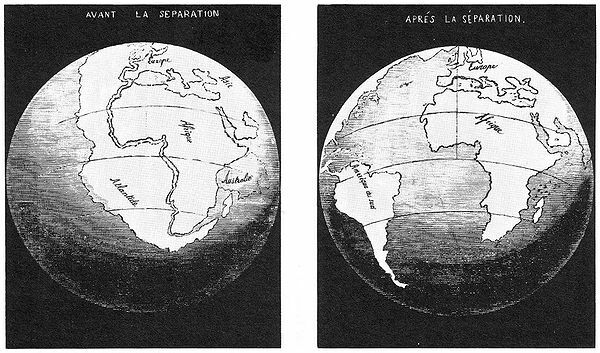 In the 1960’s, Harry Hess’s seafloor spreading hypothesis provided a better explanation for the movement of continents. He suggested that convection in the mantle and asthenosphere brought magma toward the surface and pushed the plates apart at oceanic spreading centers. Hess’s theory was later confirmed by the Vine-Matthews-Morley hypothesis and by magnetometers passing over the ocean. Together, these scientists and instruments showed that a mirror image of reversely and normally polarized rocks (aka magnetic stripes, pictured below) across divergent plate boundaries represented changes in the earth’s magnetic field as new oceanic crust was being produced and pushed away from the central axis. Essentially, because iron bearing minerals in new oceanic crust aligned with the Earth’s magnetic field, and because the Earth’s magnetic field changed through time, a reflected pattern should be observed across the rift – and indeed it was! A similar pattern was observed in the following years when scientists were able to radiometrically date rocks on either side of the divergent plate boundary which increased in age away from the ridge axis. Collectively, these observations, hypotheses and theories about divergent plate boundaries helped set the stage for the theory of plate tectonics and the foundation of geology as we know it today. 1. What type of structures help accommodate differences in spreading rates along divergent plate boundaries? 2. What type of rock is located at the base of an ophiolite sequence? 3. Who is credited for proposing the seafloor spreading hypothesis?